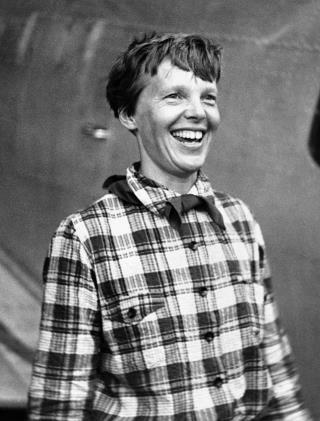 (Newser) – Amelia Earhart buffs will likely to be tuning in to the History Channel at 9pm Eastern Sunday for a documentary that floats a provocative theory: Investigators say a newly surfaced photo shows Earhart and navigator Fred Noonan on a dock on one of the Marshall Islands, suggesting that they were rescued by the Japanese military after crashing and then imprisoned. A post at the Daily Beast, however, joins the skeptics: It notes that a Japanese author tracked down a surviving member of the Japanese ship that allegedly transported Earhart to Japan, and the telegraphist was adamant: The ship never spotted Earhart, alive or dead. Meanwhile, a competing theory that Earhart crash-landed on Nikumaroro Island is still alive after an unusual hunt involving forensic dogs. Wow. Makes me think even less of the history channel for partnering with these clowns. Doubt they're "on the ocean floor". If they did escape the plane and then drowned, their bodies have long since decomposed.